Super Bloo Bros. Vs The Blue Blur: Right Back At Ya! 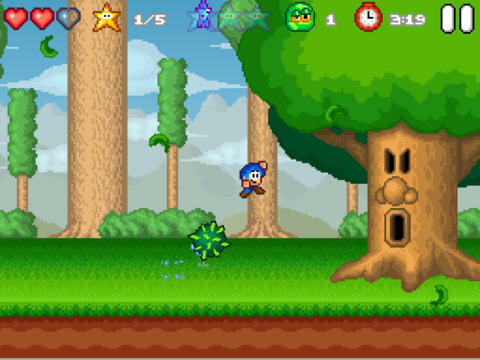 The gameplay is incredibly enjoyable as you will quickly find out the game uses mechanics from many 90's platformers including Super Mario Bros., Sonic The Hedgehog, Alex Kidd, and Kirby. The overall mixture is perfect with Mario-like physics, Alex Kidd-style item collecting, and blatant enemies and bosses ripped straight from Kirby and Sonic games! In-fact the first boss is for all intents and purposes Whispy Woods from the Kirby titles! The game has you collect items, defeat all enemies, speed-run, etc. as goals, if you complete all goals in every level something special will occur! The stages themselves, despite being heavily influenced in-terms of their themes are quite clever in design and still feel completely unique which is not only a good thing, but is highly surprising considering the amount of outside influence this game possesses. Another thing worth mentioning is that the developer has announced that there will be fifteen new stages added as dlc in the near future which will add even more content to this superb title! The update will fix several bugs as well, though we didn't experience any during our playthrough of the game. 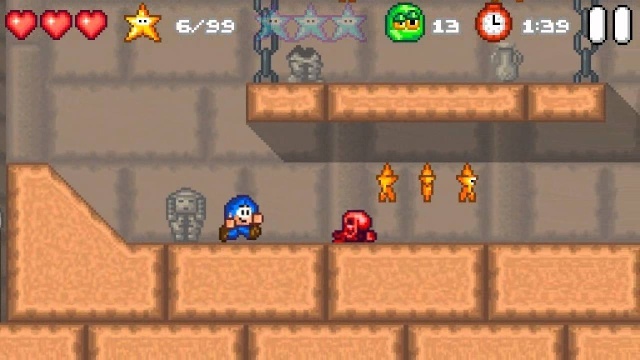 The controls are silky smooth and very easy to learn, while the game's level of difficulty starts off easy, but becomes fairly challenging later in the game. Visually the game looks great, but you won't be blown away by the graphics. The character model and enemy sprites are quite detailed and look nice and the game's soundtrack is catchy and enjoyable. You'll definitely be humming some of the tunes after playing the game! Overall on the audio-visual side of things you may not be wowed, but you will definitely enjoy it nonetheless! 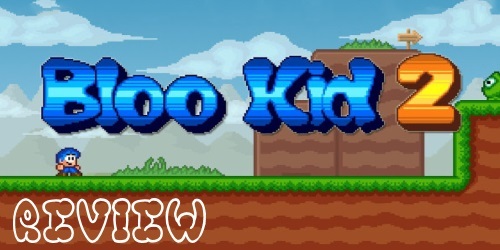 With great gameplay, flawless controls, and a solid audio-visual presentation, Bloo Kid 2 is a superb game that any fan of the platforming genre should highly enjoy, however we do have to dock some points due to the lack of originality, however we still highly recommend this game to all 3DS owners! It's time to take on Wyspy Wuds! The copyrights that this game has broken lol. I sense a pending lawsuit. Looks good, but I agree that it's pushing the limits as to what is allowed through copyright laws.